NATIONAL University saw opponents turn into allies as UST and FEU fans were among the crowd of 7,200 people who cheered them to end University of the Philippines’ Final Four hopes on Sunday at the MOA Arena in Pasay City. While waiting for their respective team's match, the Tigresses and Lady Tamaraws fans were hoping that the also-ran Lady Bulldogs would play a spoiler role and beat the Lady Maroons for UST and FEU to complete the Final Four cast. During the toe-to-toe fifth set, UST and FEU fans, who both wore yellow, surprisingly cheered for NU that out-roared the UP fans. A group of yellow-clad supporters even shouted, ‘NU! NU! NU!’ during the crucial stretch of the decider. Audrey Paran nailed the match-winning spike that shattered UP’s semis hopes and sent UST and FEU fans into a wild celebration as their teams joined Ateneo and La Salle in the Final Four. She was surprised of the sudden support. 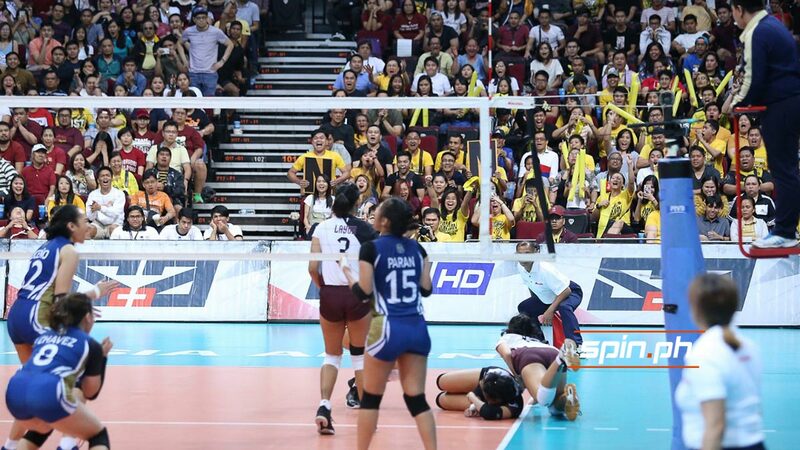 “Yun ang mini-mean ko dun ha nothing against NU supporters. Baka ma-bash ako,” she added. Libero rookie Jennifer Nierva, who protected the floor with 30 digs and 27 excellent sets, said she was energized by the crowd. NU head coach Norman Miguel also bared that their goal was not to spoil UP’s Final Four chances but to end their season on a high note.